O'ahu, Hawaii, United States - At sunset on the shores of Kaka'ako, on the outskirts of Hawaii's capital Honolulu, Junior gets his bicycle ready to head to the nearby harbour where he picks up the rubbish from the returning tourist boats - empty cans and other scrap metal that he exchanges for cash the next day at a recycling place. "Recycling keeps me busy and out of trouble," Junior says. The 54-year-old native Hawaiian prefers to go by his nickname - Junior is what everyone calls him here. He stays in a tent perched against a wall in the beach park of Kaka'ako. He has been living like this for more than 20 years. 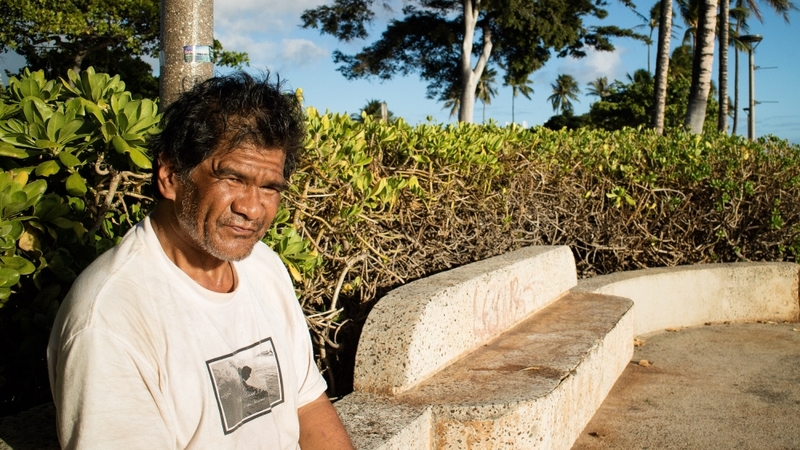 Junior is just one of Hawaii's large population of homeless people, which, according to official statistics, numbers about 7,000 people - the highest per capita number of homeless in the US. But experts estimate the actual number to be much higher. Most of them stay on O'ahu, the most populated of all Hawaiian islands. Here, the homeless can be spotted along the long coastlines or in the beach parks. Since the state government implemented a sit-lie-ban in the tourist areas of Waikiki, they mainly stick to the poor Western parts and the outskirts of Honolulu. "It is multiple trends converging to a bigger problem here," says Kimo Carvalho, who works with the Institute for Human Services (IHS), which runs several shelters and cooperates with other organisations to provide the homeless with medical care or get them into housing. "People are falling into homelessness at a quicker rate than what we are able to move out of," says Carvalho, listing the main factors that lead to the high number of homeless in Hawaii: lack of affordable housing, an epidemic in the use of synthetic drugs, insufficient support for the mentally and physically ill, prisoners discharged without any safety net and people coming to Hawaii with misconceptions about opportunities and then running out of money. Adding to all that is a cutback of social services that took place back during the administration of George W Bush, as well as personal problems and traumas. "Everyone we look at has lost something," says Carvalho. Junior lost his father at the age of 25, an experience he says threw him off track. "Then I lost my job, got into drugs," he explains. He used to take part in bodyboarding competitions and says he liked to party, never staying in one job for long. For a while, he sustained himself by fishing and selling his catch, until the market closed down, "because of all the buildings going up, just for the rich," says Junior referring to real estate developments, one of the major factors driving up the cost of living here. While some of the causes of homelessness are the same here as anywhere else, the economic factors are quite specific to Hawaii. The islands are a popular tourist destination and a lucrative place for real estate investments. Even a modest single-family home sells for more than $750,000 and a small studio costs at least $700 a month to rent. Adding to the rapid inflation have been the large army bases. Soldiers deployed there receive hefty subsidies, if they are living off base. The high costs of living and a shortage of affordable housing leave people with a low or even medium income struggling. Jonathan Castillo is a quiet, almost shy man, with a bright gentle face and a small moustache. "Rent and food: it's so expensive in Hawaii," says the 59-year-old. "It really wasn't like this when I was a young gentleman." He estimates that a single person would need at least $2,000 a month to lead a decent life. Castillo used to work for the Salvation Army as a transportation manager and was running the computer room. The death of his father and a divorce left him struggling to cope. Then, he suffered a back injury which prevented him from working and he became reliant on social security. He ultimately lost his home. "I just couldn't afford the rent anymore," he says. "I know there are many people who are just a pay cheque away from where I am." About two weeks ago Castillo moved into a shelter run by the IHS and the city of Honolulu. It's located in an industrial area, and consists of a spread out open space with shipping containers that have been turned into housing units. It's a rather new concept for a shelter giving people more privacy and a bit of a community feel. It aims to help them make a smoother transition into permanent housing. "I never thought I'll end up like this. It was hard for me. I always thought, I got this. It took a giant leap to ask for help." Castillo says he hopes to move back into a proper home soon. "It has been a game-changer for us," Carvalho says of the shelter. But, relying on social services or keeping the strict rules that apply in most shelters is not for everyone. On the westside of O'ahu, some homeless people have found yet another solution for themselves. Next to the boat harbour of Wai'anae, about 200 people have settled down between shrubs and trees that have overgrown a reef. "I've been living here for 14 years," says Twinkle Borge. The 46-year-old native Hawaiian is one of the founders. She calls the settlement a "village" - and indeed, it looks quite different from other agglomerations of tents. The encampments are larger, using tarps and palettes. Most of them are equipped with proper beds, shelves and a kitchen running on gas cylinders. They even have patios decorated with flowers and fenced with wood planks or stones for privacy. The earthen paths leading through the settlement are neatly swept and at the centre lies a community garden with a chicken pen, herbs and taro plants. "Everyone has to give eight hours of community service a month," explains Borge, who used to be a social worker before she became homeless. With her natural aura of authority, she has become the leader of this place. Her story resembles that of many here. While working two jobs, too busy to realise what was going on, her partner used up all her savings for drugs. She lost her house and fell into a depression, turning to drugs herself. "Here I got sober," says Borge, she says of her life in the "village". That's why she doesn't want to leave, even though she could be living in a proper house with her elderly father. Instead, she goes to take care of him during the day. Their sense of community has helped many of those who live there get back on their feet and off drugs. Another name they like to use for their settlement is " Pu'uhonua", a Hawaiian term for a place where lawbreakers and troublemakers could find refuge and not be persecuted until they redeem themselves and integrate back into society. This is how those who live there wanted to be understood. But until about three or four years ago, things didn't run as smoothly, recalls Borge. "We had police come in here and point guns at us." Drugs and the stigmatisation from surrounding areas were a problem for those who lived here. "We are not bad people, just having a hard time," Borge says. With the help of some other women appointed as captains of their areas, she has managed to turn things around. They conducted meetings with the surrounding community, with the school, the authorities and several social organisations. They set up rules for the settlement, Borge says - "No stealing, respect your neighbours, keep your area clean." If conflicts come up, people can turn to the captains or Borge herself to mediate. "If it can't be solved by talking, we also have a boxing ring. So just go take it there. And I can tell you, we had a couple of good fights." The concept has worked, but not perfectly. Theft and quarrels still happen, but there is an overall spirit of cooperation, and even people from the adjacent neighbourhoods have come around. Now, almost every day something is going on. Visitors come with donations of food, clothes or school supplies, conduct tutoring or activities for the kids, screen a movie in the nearby park, health workers visit for regular check-ups and many of the residents have found jobs with local businesses. Borge has taken her initiative even further. She has registered as a non-profit organisation and is looking into leasing the land to make the settlement legal. The idea of creating safe-zones for the homeless to camp legally has been around for years, although the authorities never followed through. A few months ago one such camp was legalised on Big Island, but it is perceived only as a temporary solution before moving people into housing. Legalising the Wai'anae harbour camp would be the first attempt to take into consideration peoples' wish to live in a community of their own making.